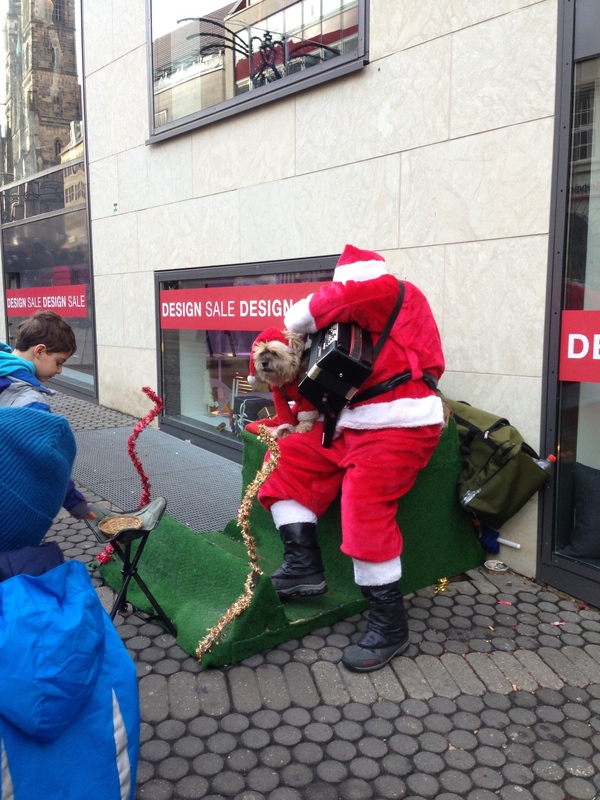 The Christmas market day trip started with a post that my friend, Melannie, posted on her Facebook page – “Any of my friends in Germany want to join in on this trip to famous Christmas markets on the 22nd of Dec?” Umm, yes. Of course! Keila (who I went to Paris with) also was in, so it was a done deal. Girl trip to Christmas markets! We were up bright and early to head to the tour center. We were some of the first year, and when he said we could board the bus, I ran like a loser, well, more ran/walked. Jogged maybe. 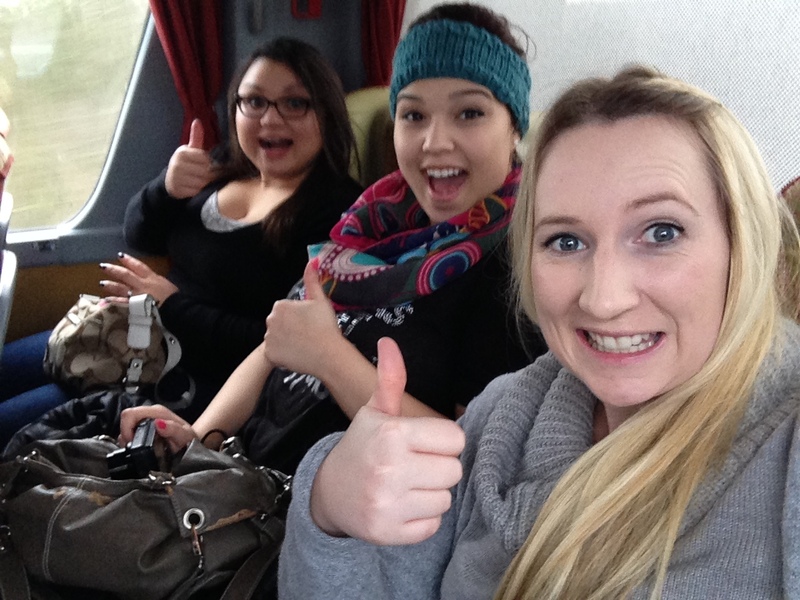 I wanted the back of the bus after the Paris experience so that we were more comfortable. In the end, we ended up with the back of the bus entirely to ourselves because one person didn’t turn up and no one saw our one seat in the corner – score! We all got to take turns at sleeping and it was a much more comfortable trip. 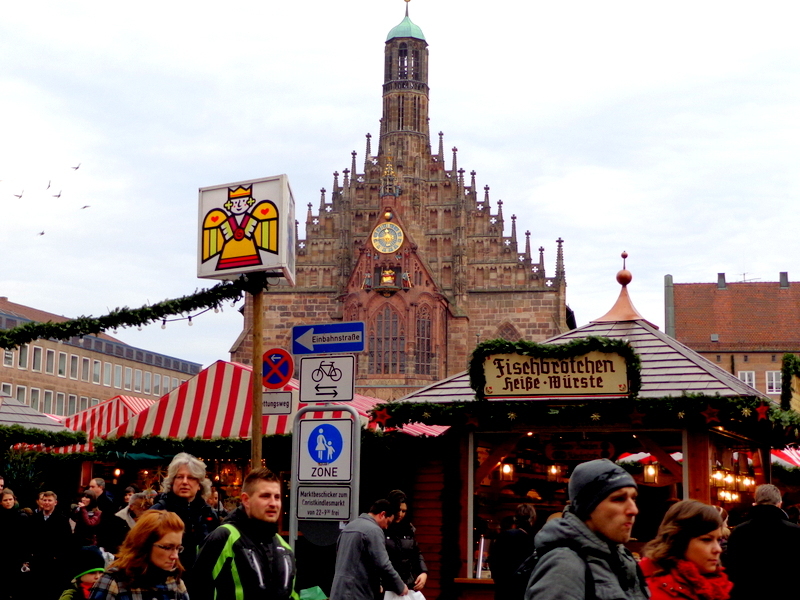 First stop was Nürnberg, famously known for the German Nazi trials, but also for its Christmas market. We arrived and set to work finding some gluhwein, as it was a pretty cold day. Melannie got distracted by some chocolate covered strawberries on a stick – they looked delicious! There were sellers of them everywhere at the market. We eventually arrived at the main square market (there were several all joined within walking distance). It turns out there’s more than one version of gluhwein, and after the Brussels experience, I was keen to give a different one a go. The white wine version was definitely way better, and it even gave me a bit of a buzz! We ate some tasty treats and ended up waiting to watch something that everyone was standing around for. It turns out it was something going on in the clock tower – it was a bit like a cuckoo clock but with a whole storyline. Honestly, it wasn’t worth the wait, and it was kind of hilarious that Keila was filming it. There was a cute children’s market that had all sorts of rides in the area. There was a miniature ferris wheel, a full size merry go round (that we wanted to go on, but couldn’t figure it out), treat stands and lots of activities for kids. One random thing was there were two ‘Santas’ near each other, both with dog sidekicks. When we saw the first one we were excited, and then we saw another one along the way that no one was watching. He was a super cute little dog too, he looked like Oscar the Grouch in dog form, haha. 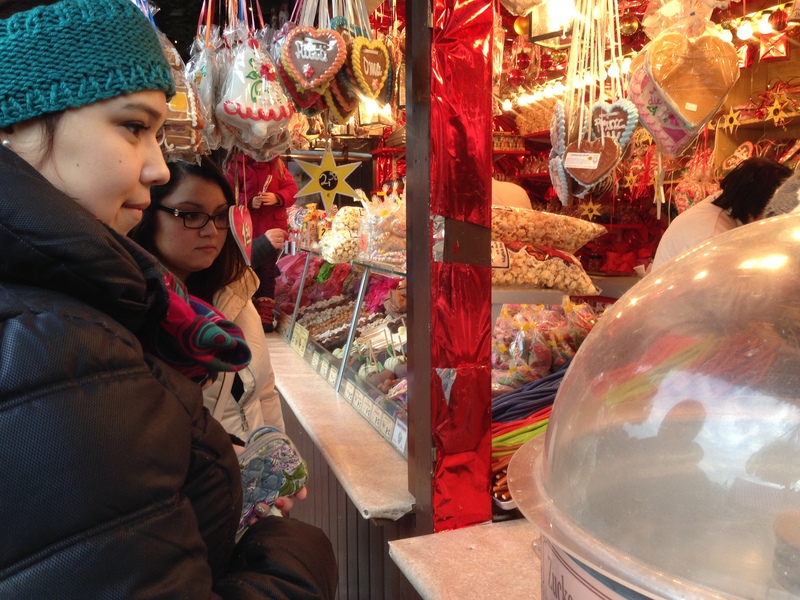 Much of the stalls just had typical Christmas market wares – i.e. food (usually German brotchens with pork sausages), sweet food, Christmas decorations for trees and the house, warm weather gear and house knick knacks. It especially felt like this market received a lot of tourists, because people were quick to speak English when they realized we were all English speakers, and were really nice. After lunch it was time to head back to the bus. This time it was only about 1 ½ hours to the next stop! Rothenburg was a magical place! It is a medieval old town still surrounded by walls. According to Wikipedia (this isn’t a university assignment), the town was seen by the Nazis as “the most German of German towns” and was used in propaganda. The US Assistant Secretary of war knew of the historical (medieval) importance and beauty of Rothenburg, and ordered not to use artillery in taking Rothenburg. The Nazi military commander gave up the town, not wanting for the town to be destroyed in any eventual battle. Any damage that was suffered in the war was quickly repaired by locals, and also by donations from overseas organisations. We arrived late in the afternoon, and the market was buzzing. It was much busier than Nürnberg, or perhaps it was much busier simply because it was less spread out. The market centred also around the square. 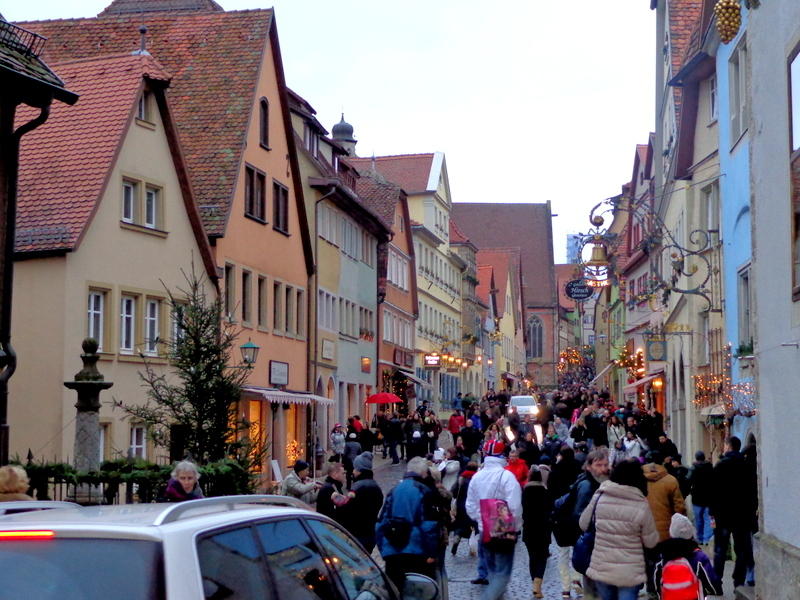 We set out to search for another gluhwein mug (a lot of people collect them as souvenirs) but Rothenburg’s was disappointing, so we didn’t bother trying to fight the crowds to get any. 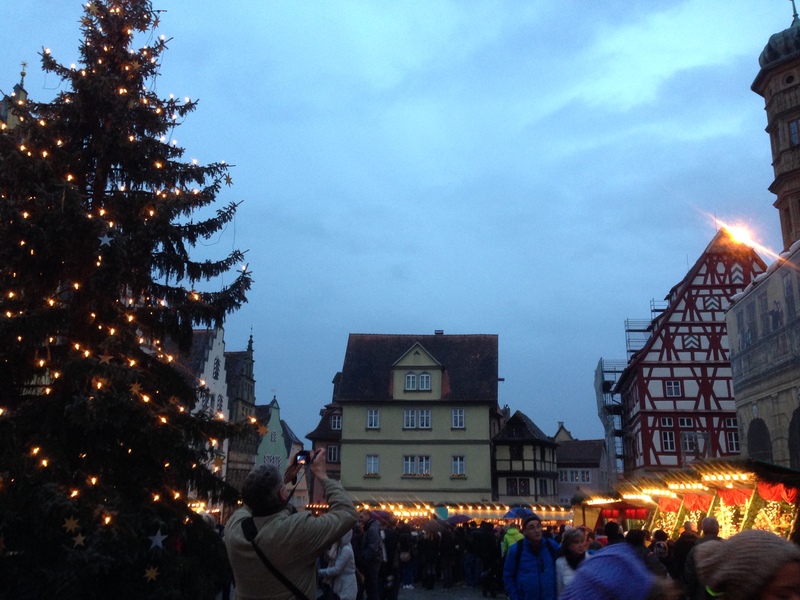 Rothenburg market was much more quaint and magical, but the downside was how busy and cramped it was. It started drizzling, so umbrellas came out making it even tighter. It was also the very last day of the market, which didn’t help. However, the surrounding shops were also open so we set out to have a look through them. I’d love to go back when it’s not Christmas time! Eventually our bellies got hungry, so we ended up going back to a Chinese restaurant that we passed on the walk into the market. Random I know, but it was cheap and it meant we could escape the cold that quickly descended over the village. That, and a lot of the shops were closing up and we still had 2 hours to fill. The sweet n sour chicken that I had was pretty good, and the bill was reasonable! It was time to go back to the bus and make the 3 ½ hour bus ride home. It was definitely an awesome day out, and I’d do it again. It was only $59 for an entire day, which was super reasonable for how far we went.